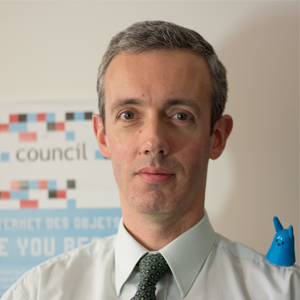 Olivier has been project manager for French Ministry of Economy and Industry since 2006. At Directorate-General for Enterprise (DGE), he is in charge of the fields of Radio-frequency Identification (RFID), Machine-to-Machine and Internet of Things (IOT). He has been involved in the former Experts Groups set by the European Commission on RFID and IOT and launched the French Reference Center for RFID. He is the national focal point of the Competitiveness cluster for the Future of Shopping and a member of the French Tech team, conducting a national initiative in favor of Start-ups, and of the group for Industrial Connected Objects, part of the New Industrial France, an opportunity to promote French industry’s capacity for renewal and innovation. Prior to his position in DGE, Olivier has been in charge of strategic projects for the French Air Force at Direction Générale de l’Armement in Paris and for the French Navy in a cooperation program in London. Olivier is a senior officer (military engineer) and graduated from ENSTA Bretagne in Telecommunications and Electronics.